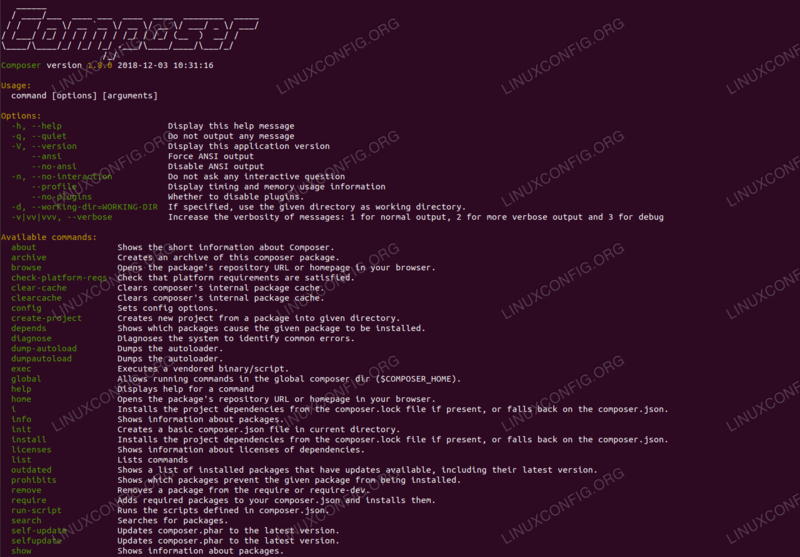 Composer is a dependency management tool for php, much like cpan for perl. If you have read the tutorial about installing cpan, the architecture will be somewhat familiar. Composer, as a command line tool is the client that can fetch and update the php libraries we mark as needed, as well as the libraries these depend on, etc. The source of these libraries is packagist.org, a large public php package repository. We can browse the repository with a browser to find the packages we'd like to use, then include them in our projects with the help of Composer. And by solving the dependencies itself, Composer can make our lives much easier if we depend on external packages. In turn we can also share our libraries, so the community can access them trough Composer as well. In this tutorial we will install Composer on Red Hat Enterprise Linux 8, and mark a package as needed dependency for our project, to see the tool working. To be able to use composer we naturally need php, with some extensions. PHP 7.2 and extensions for it are reachable after enabling subsription management repositories, as well as on the installer distributed in ISO format. # php -r "copy('https://getcomposer.org/installer', 'composer-setup.php');"
To be able to access the tool from anywhere on the system, we place it on the $PATH. /usr/local/bin is included in the $PATH by default. If we list our working directory, we'll see a lockfile, and a vendor directory. The later is the one where composer downloaded the required packages. Within the vendor directory is the package we needed, and an autoload.php. This is the only file we need to include in our code to use any of the libraries we installed with composer. It is regenerated on new package install/upgrade.